As expected it didn’t all go Cookstown’s way but the 2017 champions were able to claim the title again with a win over a star-studded Banbridge side in the final game. It was a quick turnaround for Cookstown with Queen’s up in Game Three. The home side make the Tyrone men work for it, holding them to a 3-3 draw thanks to goals from Smyth (2) and Scotty McCabe. That meant that Cookstown had to win in their last match against Bann. In a tense affair the Reds emerged as 4-3 winners with Jack Haycock hitting a double alongside scores from Kerr and Raymond Miller. Cookstown will now represent Ulster at Irish Indoor Finals on Sunday next at Antrim Forum. Congratulations to the squad: Ashley Gillis, Dan Crooks, Jack Haycock, Stu Smyth, Michael Kerr, Scotty McCabe, Raymond Miller and Mark Crooks. It was another great weekend for Cookstown with the club remaining unbeaten for the second week in a row. 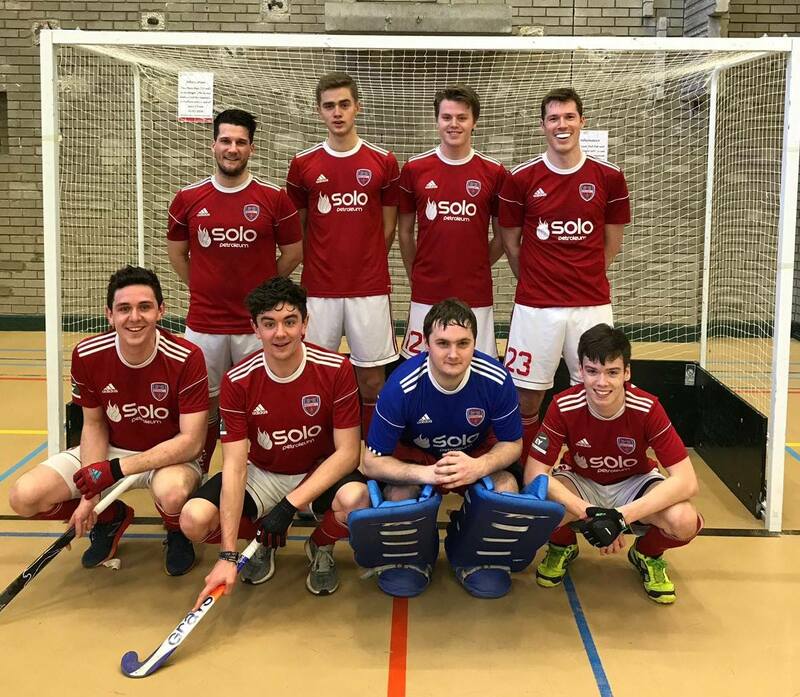 Cookstown Men’s 1st IX were away to Newry Hockey Club in the Anderson Cup and managed to get a 6-2 victory. Scott McCabe scored twice with the other goals coming from Paul Thompson, Stu Smyth, Callum Anderson and Raymond Miller. Cookstown Ladies were up against CI Ladies Hockey Club in the first round of the Plate and won 2-1 with goals by Leanne Johnston and Rebecca Nelson. Cookstown II had the early slot against Northern Ireland Civil Service Hockey Club at Steelweld Park. Two goals each by Davy Atkinson and Alan Carson as well as scores by Stevie Allen, Paul Watt, Andy McWhirter and Gavy Butler gave them a 8-2 win in JL1. Ethan Grieves had his debut in goal and had an excellent performance. Cookstown III also had a special guest appearance in goal with Chrissy Burns donning the pads away against North Down Hockey Club. Two goals by Gareth Cuddy and a score by Graeme Black helped them to a very useful share of the points. The performance of the weekend goes to Jack Patterson who smashed a hat trick for Cookstown IV at home against Mossley Hockey Club. Gary Major’s charges won 6-2 thanks to a brace from Steven Stewart and a conversion by Thomas Hutchinson. They were even able to accommodate a run out for Ian Cheevers for the first time this season. Brilliant work from all our teams!